Then, Ced Benson allegedly punches a Sixth Street barkeep, then gets arrested for it a month later. I don’t know the circumstances of the events of that fateful night, but if the Library’s bar tenders were indicative of your average Sixth Street ‘keeps, I don’t know what Benson was thinking. Finally, there’s Phil’s son who was arrested last night (or this morning) for driving under the influence of marijuana. I have no idea what has gotten into these UT guys. VY gets some props for not allowing the brand to be besmirched, but then again, it was 3 a.m. at a scrip club. That’s 3 former Longhorn greats (Phil’s son gets the nod only by association) who have run afoul of the law and it’s only July 1st. Summer has 2 months left, plenty of time for say, Dusty Mangum to get picked up for breaking and entering. Well, suffice it to say, that sound plays second fiddle to the drone emanating from those ubiquitous South African “stadium horns”, vuvuzelas. That infernal noise was first heard by a worldwide audience during last year’s Confederations’ Cup. They were annoying then, and they are annoying now at the World Cup. Opinion varies as to whether these horns are “annoying irritants” or “joyful expressions of African culture”, but at the risk of sounding dismissive of other cultures, they simply are annoying and irritating expressions of joyful African culture. 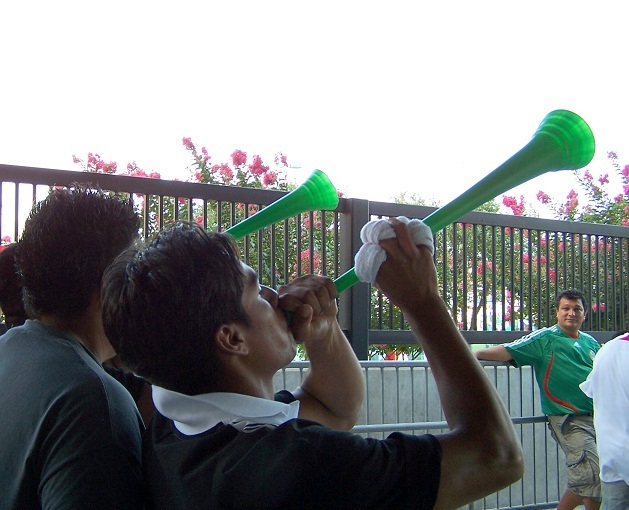 I took this pic after a México win at Reliant Stadium a couple of years ago, a match which proved to be my first exposure to the glorified funnels. As horrible as the noise is, it can’t take away from the beautiful game, especially at an event like the World Cup. However, it would be a good if somehow Univision or ESPN found a way to filter out the vuvuzela noise, as the BBC is thinking of doing. What is it with Italy allowing headers from Latin American teams at the World Cup? In ’02 it was México’s Jared Borghetti and today it was Paraguay’s Antolín Alcaraz who did the honors. Like in ’02 against El Tri Italy tied with Paraguay 1-1. ESPN, I know that you learned from the last World Cup and hired good announcers to man your booth but you are still lagging behind Univision’s varsity, Pablo Ramirez and Jésus “El Profe” Bracamontes. After Italy equalized today, Ramirez sung in Italian. That is how you do it ESPN. When a goal is scored don’t call it like it’s a throw-in, call it “with feelin'” as Jon Bon Jovi crooned. Finally, on a totally unrelated not, you are very welcome Baylor. 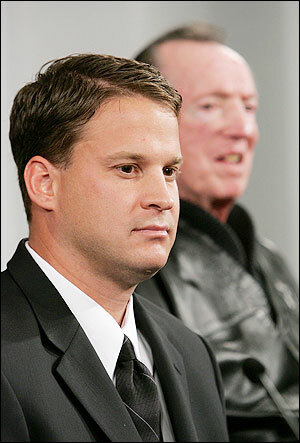 I’m not here to lambast former Tennessee coach Lane Kiffin (below on the right), now head man at USC. Tell me who amongst you wouldn’t leave your current gig for a better paying and more prestigious one? Can’t fault the man for leaving UT the Lesser and going to a place with sunnier skies and more teeth per capita than Knoxville, Tennessee. I can’t even fault him or his staff for luring recruits away from Rocky Top and towards SoCal. 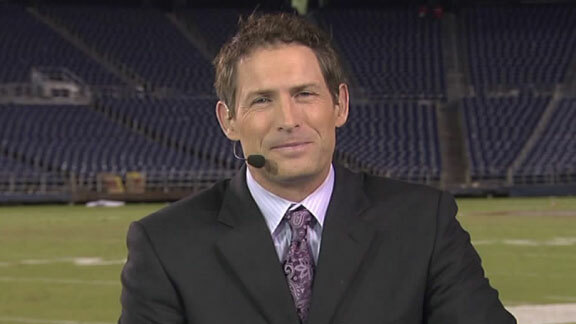 Sure UT the Lesser fan is bent out of shape and whining about the unethical nature of Kiffin’s departure and antics. How comical is to watch any SEC fan complain about ethics in anything much less in college football recruiting, but I digress. No, I’m here to marvel at the mountain of keish it took to buy out Mr. Kiffin’s Tennessee contract: $7.5 million. Fortunately for SC, it has have plenty of rich alumni who are more than willing to foot that bill. 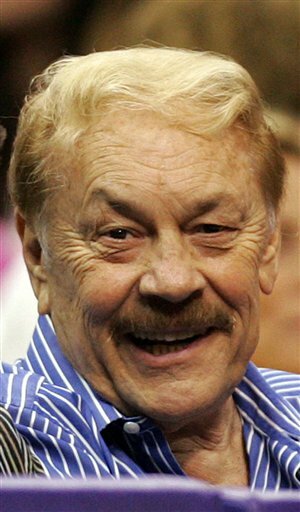 In this particular case, the money man was Lakers owner Jerry Buss (below). Yes, that’s the same man who gave the world the gift of that keeps on giving, Festivus. If anyone gets a clip of Lane Kiffin attempting to pin his benefactor during the Feats of Strength, please do share. Country music act, Little Texas, had a hit song back in the early 90s titled “What Might Have Been”. Here’s the video in all of its mulleted glory, view at your own risk. 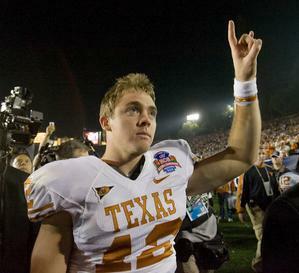 One could say that the song’s title in large part, defines Colt McCoy’s (below, photo credit: Ralph Barrera, Austin American-Statesman) illustrious career at The University of Texas. 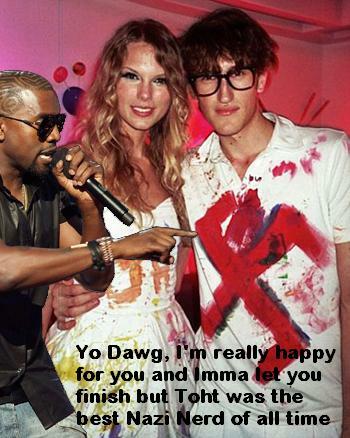 Let’s hop on the DeLorean and travel back to November 11, 2006. Texas, fresh off a national title, is 9-1 and in the driver’s seat of the Big XII South despite starting a redshirt freshman at QB, Colt McCoy. Their only loss came at the hands of #1 Ohio State. They’re in Manhattan, Kansas to take on a mediocre K-State team. First drive of the game, Texas moves the ball down the field gets close to the goal line. On a 4th and 1, a QB sneak is called, Colt runs it in for the score but suffers a neck stinger knocking him out of the game. In comes true freshman Jevan Snead who performs as well as one can expect. Colt’s injury more than likely cost the Horns a Big XII title (they lost to KSU then to A&M, opening the way for OU to take the Big XII South) and possibly a shot at a rematch against Ohio State in the National Title Game. Horns end up in the Alamo Bowl, beat Iowa and hope springs eternal for 2007. The voters of H-town have spoken and their voice has been heard. Annise Parker has emerged victorious from the mayoral runoff election despite the fact that 11-year-old sources were the fulcrums of her TV ads, but I digress. Historical events trump stale cheap shots and differences in spellings. Given H-town voter tendencies, these 5 ladies will own the city of Houston should they ever decide to embark on political careers here in the Spice, er Space City. In more serious news, President Obama was robbed tonight at the Downtown Athletic Club. Mark Ingram? Really, Heisman voters? How many “Beer Summits” has he presided over? Public Enemy had it wrong, 911 isn’t a joke, Heisman voting is.